On the night of August 18, 1781, Clark and his men floated past the mouth of the Great Miami River, near the present-day border between Ohio and Indiana. Brant's party was hidden on the northern bank of the Ohio, but with too few men to confront Clark's larger force, Brant remained silent and let Clark pass unhindered. This was a missed opportunity for the British and Indian war effort: had McKee and Simon Girty not been delayed while gathering reinforcements, they would have been able to ambush Clark, whom the Indians feared more than any other commander, at a moment when desertion had made him vulnerable. According to historian Randolph Downes, "Students of the life of George Rogers Clark have never sufficiently emphasized how close he and his expedition came to utter destruction as they descended the Ohio River in 1781." Although he missed a chance to ambush Clark, Brant soon found another target. On August 21, Brant captured Major Cracraft and six men who were trying to catch up with Clark. Brant also captured a few men from Captain Shannon's detachment. From the letters his prisoners carried, Brant learned that Lochry's party was not far behind. Brant sent a letter to McKee, urging him to hurry because "whilst the enemy are scadred [scattered] we can easy manage them". Brant prepared to attack Lochry regardless of whether McKee's reinforcements arrived in time. 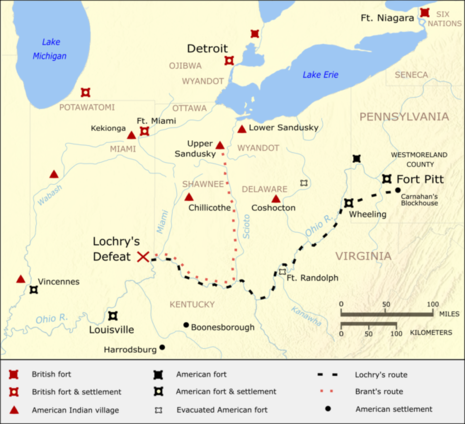 At about 8:00 a.m. on August 24, the day of the battle, Lochry's party landed on the northern bank of the Ohio River, near the mouth of a creek about 11 miles (18 km) below the mouth of the Great Miami. 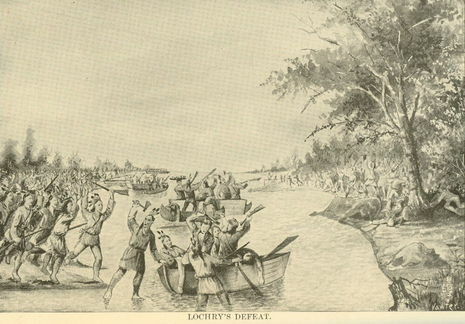 According to some brief accounts, Lochry was lured ashore in a ruse by Brant, who left captured Americans in sight and attacked after Lochry landed. According to more detailed accounts, however, Brant had planned this deception, but the Pennsylvanians happened to land a short distance upriver without having seen the captives. Nevertheless, Lochry's men came ashore close enough that Brant, who had not yet been reinforced by McKee, was still able to make his attack. Although Lochry knew that he was in hostile territory, he landed his little flotilla after two days of nonstop travel because he needed to feed his men and horses. After landing, the Americans cooked fresh buffalo meat for breakfast and cut grass for their horses, apparently not taking proper security precautions. Concealed in the nearby woods, Brant repositioned his men and then opened fire, taking the Americans completely by surprise. Some Americans fought until their ammunition ran out, although others apparently did not have their weapons ready when the attack began. Some of the Americans attempted to escape by boat, but Brant had anticipated this and had positioned men in canoes to cut off any retreat. Seeing that he was hopelessly trapped, Lochry called for his men to surrender. Although the two sides were about even in number, Brant had won a lopsided victory. All of the Americans were killed or captured; none of Brant's men were injured. According to a detailed list prepared by Brant and sent to Detroit, 37 Americans were killed and 64 were captured. Some of the American dead—some sources say most—had been executed after surrendering. This included Lochry, who was sitting on a log after the battle when a Shawnee warrior killed him with a tomahawk blow to the head. According to some accounts, Brant prevented the Indians from killing even more of the prisoners. The dead were scalped and left unburied.